Photograph Wrangell - St. Elias National Park's Skolai Pass. Visit and photograph Wrangell – St. Elias National Park with me. The largest National Park in the US. Internationally protected World Heritage Site. Home to 9 of the 16 highest peaks in the US. Home of the largest subpolar icefield in the world. The largest collection of glaciers on the continent. The premier mountain wilderness in North America. On this trip we spend 6 nights in the backcountry photographing one of the most beautiful places in Alaska. We’ll fly in to the backcountry at Skolai Pass, do a short hike to our campsite and then spend our time photographing the landscape. We’ll probably move camp once during this week to allow us more opportunities to shoot some of the scenery on the southern end of the Pass near Russell Glacier and the University Ranges. Two of these magnificent peaks stand over 15 000′ high. This is truly one of the grandest destinations in Alaska, with fantastic opportunities for landscape and wildlife photography. We’ll have beautiful campsites, great hiking, and scenery without par. We offer this trip as a fully-outfitted and catered trip (all gear and food provided) or an available discount rate for those folks who will bring their own gear and food. 2017 Arrangement In 2017 we are running this trip a little differently. We’ll spending a few days in Skolai pass, flying to Wolverine, a few days there, and a few days down at Nizina Lake. 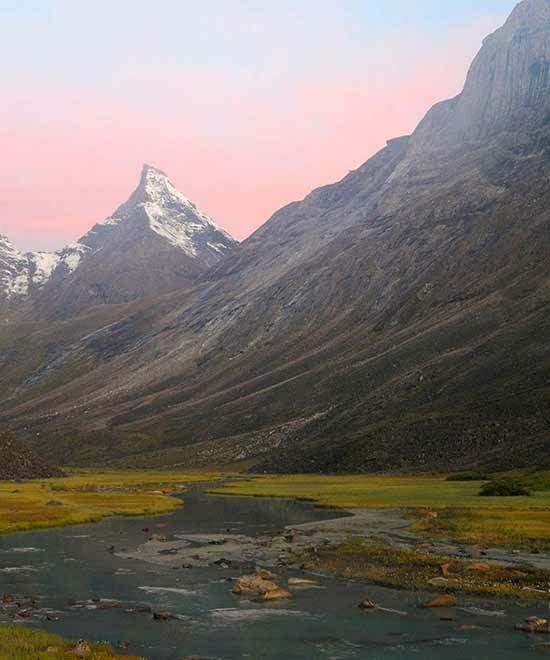 Basecamps in each place, packrafts and glacier hiking and photography at Nizina, and all the landscape and wildlife opportunities we get at Wolverine. The dates are July 12 – 24. Contact me for price and availability. Call or email us to start planning your backcountry photo tour. Read what makes my photo tours so special. Trip Options Short backpack to basecamp and dayhike or basecamp and dayhike near the landing strip. Photographic flight-seeing addition as well. This trip starts in Anchorage and we depart early for the scenic drive to Wrangell – St. Elias National Park. Travelling along the northern edge of the Chugach Mountain Range and then south along the Copper River Valley we should have (weather permitting) great views of Mt Drum, Mt Wrangell, Mt Sanford and Mt Blackburn. 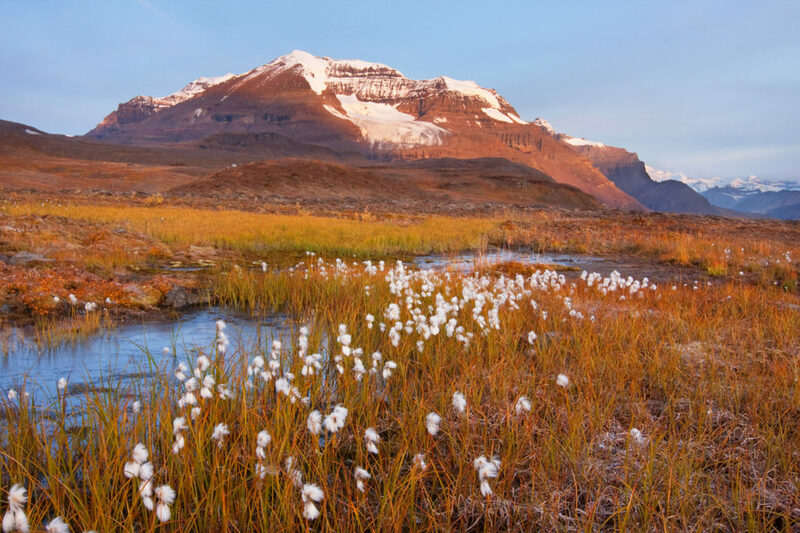 All are ice and snow-capped peaks that tower over their surroundings. We spend the first night in McCarthy before flying out the following morning in a small bush plane for the backcountry landing strip at Skolai Pass. A short hike takes us to our campsite on the tundra and then we’ll have lunch and head off for the afternoon for some photography. From here we spend the following 6 nights in and around Skolai Pass photographing some of the grandest scenery in Alaska. 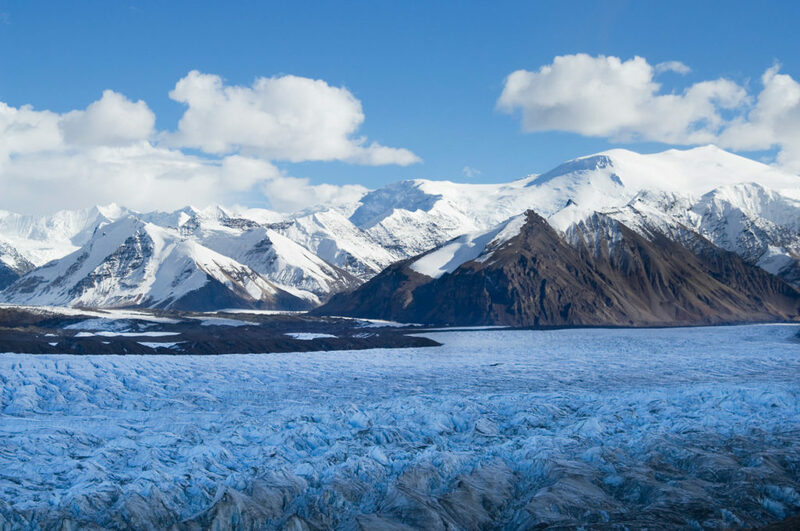 We’ll get up close and personal with Russell Glacier, visit Hole in the Wall, photograph Castle Mountain, hike over into the Chitistone Valley with it’s sweeping views, as well as the Nizina Drainage and the eastern edge of the Alaska Range, including Mt Frederika. We’ll spend time during the day hiking and exploring the area for potential images, as well as resting so we’re wide awake to shoot during the hours of good light – in Alaska during the summer, that can mean photography in the the midnight hours. On our final morning, we’ll take some photos, return to camp and get packed to await our pilot’s return for the pickup, then fly back to McCarthy for breakfast at Ma Johnson’s hotel and a shower at our cabins. Next we can catch a shuttle up to the small historic town of Kennicott and explore and photograph the old buildings and machinery left behind from the days of the copper mining. 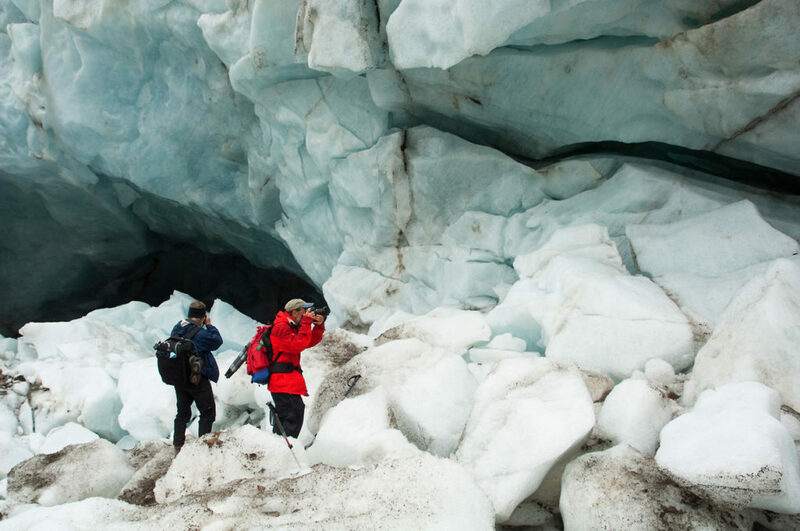 For the adventurous, another options is to hike out onto the Root Glacier. We’ll stay the night in our cabins in McCarthy, then have a quick breakfast and take the drive back to Anchorage on our final day. If the weather is in our favor, it is well worth taking a sight seeing flight around Mt. Blackburn in the morning for some aerial photography, with the potential for some truly spectacular views of the mountain range. We travel from Anchorage to McCarthy, overnight in McCarthy and then fly in to the backcountry. A week in the Skolai Pass area and we fly back to McCarthy, show and eat, and then enjoy the afternoon relaxing in the slow-paced rustic town of McCarthy, or venture up to Kennicott and look at the historic copper mine Mill buildings and leftovers of this ghost town. We spend the night in McCarthy, and travel back to Anchorage on the final day. I’ve run this trip either way. Basecamp near the landing strip and only do day hikes, carrying camera gear, etc. Or we backpack to the far end of the valley (a day’s walk) and camp there, before returning to the landing strip area. That decision is made as a group decision though, and we’ll discuss that during the booking process and see what folks would like to do. Carl’s advice = move camp. Skolai is never really buggy. A fall trip, late August/early September is likely to be completely bug-free. What kind of camera gear do we bring? Camera gear is largely personal preference. Some folks bring the kitchen sink, some bring very minimalistic setup. I wouldn’t bring a big super-tele, like a 500mm F4 or anything. Some of the new lighter f5.6 zooms would be nice to have though. Definitely your wider angle stuff and lightweight but sturdy tripod. Carl’s recommendation = less is more. Lighter is better. Do we need backpacking experience? It’s preferable. I’ve run the trip with folks who’ve never backpacked, and they did fine. We can tailor it somewhat to match what you’re up for, but some experience is obviously going to ease your pain somewhat. It’s a remote wilderness, accessible only via bush plane, and you need to be comfortable camping in that kind of situation. What clothing gear do we need? Typical Alaska backpacking gear. Conditions vary. See Alaska Backpacking FAQs. That’s up to you? Most of the folks who join our trips have their own backcountry gear, such as tents, stoves, etc, so it works well for them to outfit themselves. If you’re a newbie, don’t have your own gear or don’t want to deal with bringing it all to Alaska, Expeditions Alaska can outfit and feed you. No worries. Wildlife are usually present in the area, and photography of grizzly bears, red fox, Dall sheep and caribou also. An array of birds, including shorebirds like Wandering Tattlers and Semipalmated Plovers, as well as raptors like the golden eagle and peregrine falcon is sometimes possible. We do (usually) see bears but this is NOT a bear photo tour. Please see one of the other listings if photographing brown bears is your interest. What’s Included – MXY trips? All multi-day trips (backpacking, basecamping, packrafting, photo tours) out of McCarthy include transport to/from Anchorage/McCarthy, 2 nights accommodations in McCarthy, air taxi flights McCarthy/The Backcountry, group gear such as cook tents, stoves, fuel, BRFCs, bear spray, etc. Hiking poles are included if you don’t have your own. Storage of your overnight travel gear is limited but available (keep it small). Outfitting of equipment such as tents is available. 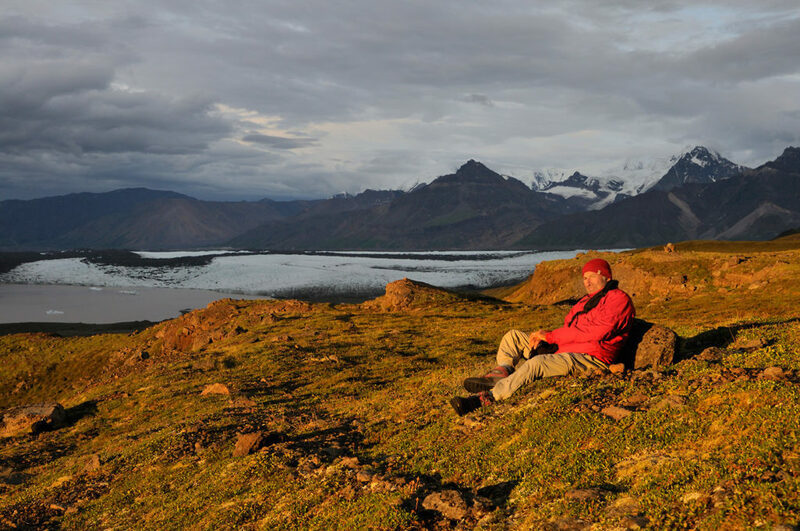 Expeditions Alaska can either fully outfit your trip (all food, tents, etc) or adjust things a la carte if needed. I know you do. As well you should. More questions? Email me or call me if you like. Upon your reservation I’ll send out a comprehensive trip information packet that covers just about everything and more you might imagine about your trip. Wanna come join the fun this summer at Skolai? One week of bald eagle photography on the famous Chilkat River. Hundreds, even thousands of bald eagles gather. So bring plenty of memory cards. The Great Bears of Katmai. Alaska. You. And Your Camera. Join us for a week of Alaska grizzly bear photography. We take care of all your logistics and make every effort to put you and your camera right in the right place. Every time.